This is one of the most original dishes. It can be typical and it can be the most exquisite dish on your table. 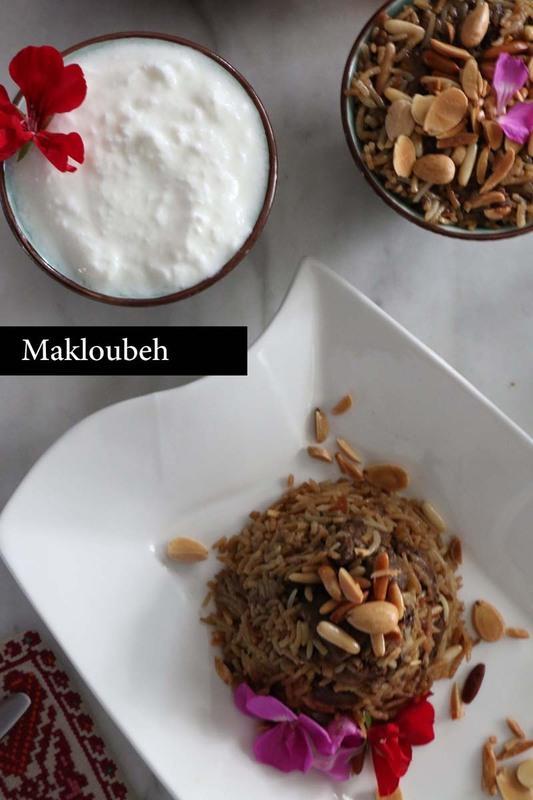 Maqlouba or Makloubeh in Arabic means literally Upside Down. And this dish is made in steps inside your cooking pan and then it is served upside down. For eggplant lovers, this will be one of your favorite recipes. This can be a vegetarian dish if you remove the meat. 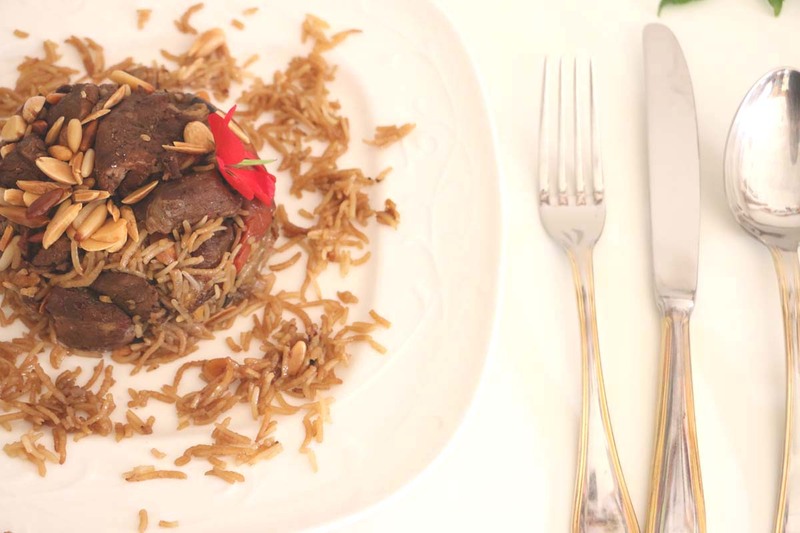 And since most Arabian dishes are made all throughout the Middle-East, it is very normal to have several accents for the dish, and different ingredients. Now Maqloubeh is a dish famous to have been originated from Palestinian families, and some people refer to it as Maqlouba, and some as Maqloubeh. At home, we call it Maqloubeh. And we make it with eggplants, lamb meat, tomatoes and red pepper. Of course the rice is essential in this dish. 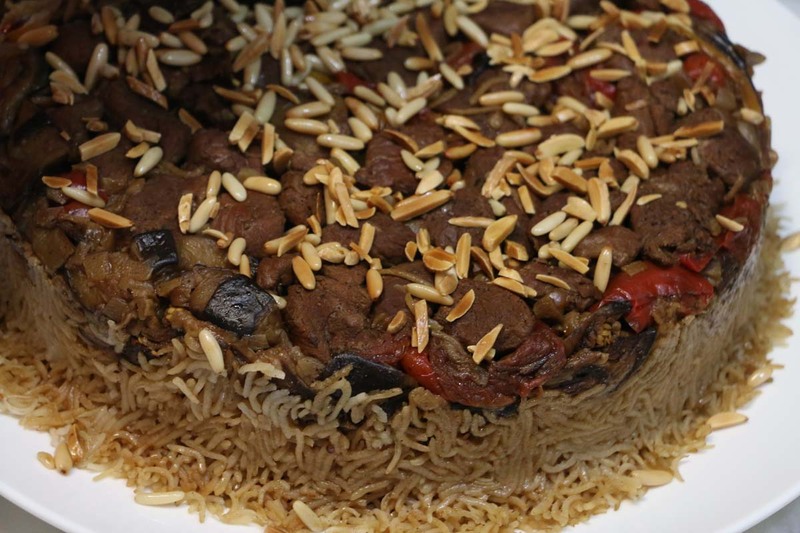 But in other houses, families, and locations, Maqloubeh is sometimes made with chicken instead of the lamb, and some make it with cauliflower instead of the eggplant. And to some they mix the two, and to others, they add potatoes. And yeah, I wouldn’t be surprised to hear other different ingredients. 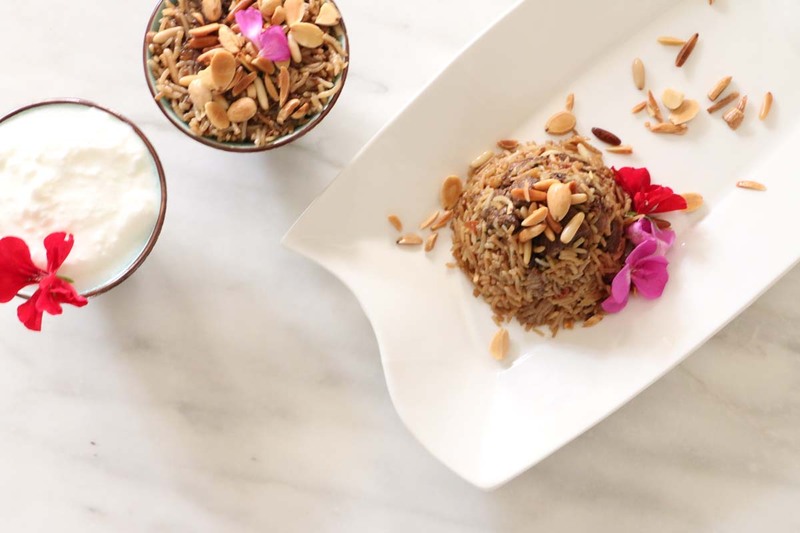 Last but not least, Palestinians love garnishing all their main dishes with roasted pine nuts and almonds. 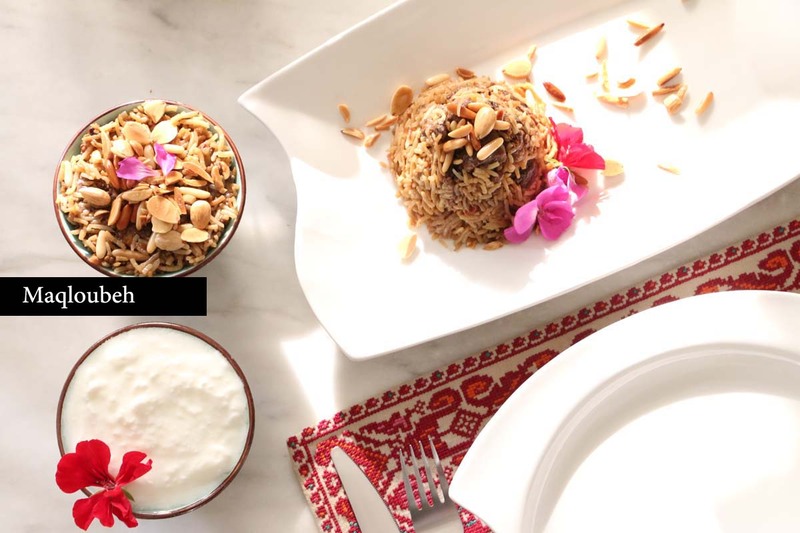 🙂 Maqlouba is always served with yogurt and salad on the side. You will love it. I promise. Wash the lamb, then add them into a medium sauce pan with a drizzle of sunflower oil and keep flipping for it to get a little tinted about 2 minutes. Add boiling water and leave to boil. Throw out the water, rinse your lamb pieces again with clean water, then add them again into the medium saucepan along with another set of 4 cups of boiling water, the bay leafs and a pinch of salt. Cover your saucepan and leave the lamb pieces to cook for about 45 minutes, keep checking on the lamb until well cooked. Preheat your oven to 350 or 400 degrees. Cut the eggplants vertically, not too thin not too thick. Add them to a strainer with a little bit of salt over a bowl and leave aside for the eggplant water to drip. This is SUZIES tip to avoid eggplants from soaking in too much oil while cooking. Cut your bell peppers and tomatoes in circular slices. Make sure you peel of the skin from the tomatoes. In a cooking pan, add the tomatoes along with 2 table spoons of olive oil and place into the oven. In another cooking pan, add the bell peppers with 2 table spoons of olive oil and place into the oven alongside the tomatoes. Once your vegetables are roasted and golden, remove from the oven. Add the eggplants into a separate cooking pan with 1/4 cup of sunflower oil. Make sure you flip your eggplants and soak them well into the sunflower oil. Place them into the oven also until roasted and golden. Wash the rice, and leave it in water to soak and set aside. In a medium to large saucepan, add the chopped onions with 1 tablespoon of sunflower oil, 1/2 teaspoon of black pepper, ground cardamom, cinnamon, and 1 teaspoon of mixed spices and mix well with the onions over medium heat. Strain the lamb from the stock (keeping the stock aside) and add the pieces over the onions. Line the tomatoes, then the bell peppers, then the eggplants, and add the lamb stock over them. Leave them to boil for about 20 minutes, you will be able to smell the spices. You can taste the stock and if you feel it needs some salt, then add 1/2 teaspoon of salt. Now strain the rice from the water, and wash the rice one last time and dry over strainer before you add it over the eggplants. The stock must still be around 2 inch over the rice, if not add some boiling water. Cover your saucepan and leave to boil for 5 minutes, then lower your heat and add a cooking metal underneath your saucepan for it to cook slow. It will take up to 30 minutes cooking or more, check your rice, until it is well cooked. Once your rice is well cooked, choose a big serving tray or plate that is bigger than the saucepan as you will be replacing the saucepan cover with the tray to flip your saucepan upside down. This is the exciting part, remove your saucepan slowly as if flipping your cake out into your serving tray. There you go, Maqloubeh is right in front of you. 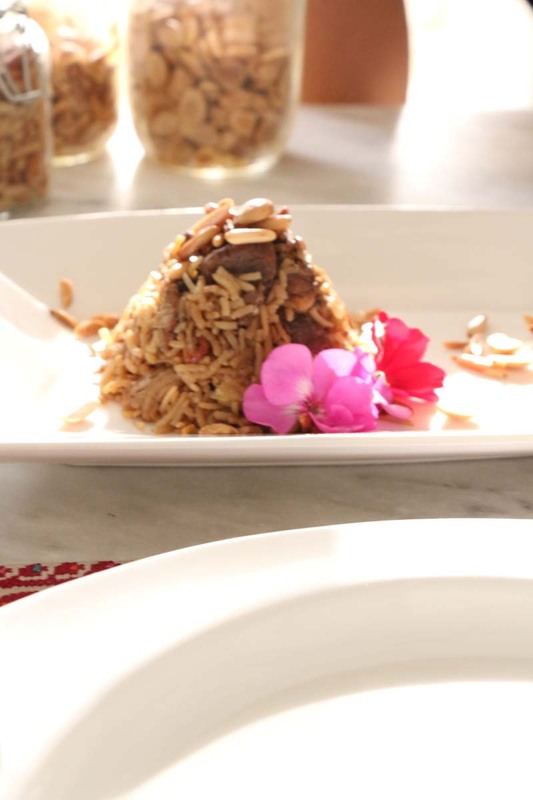 The lamb should be on top, your rice at the bottom, and you can garnish your dish with roasted pine nuts and almonds. This dish is served with yogurt and salad on the side. ١- غسل اللحمة ثم إضافتها الى وعاء متوسط الحجم مع ملعقة صغيرة من زيت عباد الشمس فوق النار و التقليب لمدة دقيقتان. إضافة الماء المغلي وترك المكونات حتى تغلي. ٢- ثم التخلص من الماء و غسل اللحمة مرة أخرى ثم إضافتها إلى الوعاء مع ٤ أكواب من الماء المغلية + ورق الغار ورشة ملح. ٣- تغطية الوعاء للطبخ لمدة ٤٥ دقيقة أو حتى تستوي اللحمة. ٥- قطع الباذنجان بشكل عامودي متوسط السماكة. ثم إضافة الباذنجان في مصفاة ورش ملح على الباذنجان. و تركه ليسيل عنه الماء. ٦- قطع الفلفل الحلو و الطماطم شرائح دائرية والتأكد من تقشير الطماطم أولاً. ٧-تضاف الطماطم في صينية الطهر مع معلقتان من زيت الزيتون ثم توضع في الفرن. ٨- يضاف الفلفل الحلو مع معلقتان من زيت الزيتون في صينية أخرى ثم توضع في الفرن. ٩- ترك الطماطم و الفلفل الحلو في فرن لمدة لا تقل عن ٢٠ دقيقة حتى تستوي و تتحمر. ١١- يغسل الأرز، و يترك في وعاء مع الماء و يوضع جانباً. ١٢- توضع حبات البصل المفرومة في وعاء طهر متوسط الحجم ويترك على نار متوسطة، وتضاف ١/٢ معلقة صغيرة من الفلفل الأسمر، هيل مطحون، قرفة مطحونة، ثم معلقة صغيرة من البهار المشكل. ويخلط المكونات جيداً. ١٣- إزالة اللحم من الماء (ترك ماء اللحم جانباً للاستعمال) ووضع اللحم فوق البصل. ١٤- صف الطماطم فوق اللحم، من ثم الفلفل الحلو، ثم الباذنجان، ثم إضافة ماء اللحم فوق الباذنجان. وتركهم للغلي لمدة ٢٠ دقيقة، تذوقي الماء للتأكد من طعم الملح وإضافة ١/٢ معلقة صغيرة إن لزم. ١٥- إزالة الأرز من الماء، ووضعه فوق المصفاة للتنشيف قبل إضافته فوق الباذنجان. يجب أن يكون هناك تقدير ١/٣ الإصبع من الماء فوق الأرز وإضافة ماء مغلية فوق الارز إن لم يتحقق المقدار. ١٦- تغطية الوعاء و تركه على النار لمدة ٥ دقائق، ثم خفض الحرارة و ووضع حديدة طبخ تحت الوعاء للطبخ ببطء. ترك الوعاء على النار لمدة ٣٠ دقيقة. والتأكد من استواء الأرز. ١٧- تستخدم صينية تقديم كبيرة الحجم، وتوضع كغطاء وعاء الطبخ لتقلب الطبخة. هذا هو الجزء الحماسي المتعلق باسم الطبخة! إزالة الوعاء على مهل، كما تقلبي و تزيلي وعاء الكعكة للحصول على طبخة المقلوبة. ١٨- المقلوبة جاهزة! أضيفي الصنوبر و اللوز المحمص فوق الطبخة للتزيين. يضاف بجانب المقلوبة اللبن و السلطة. – it’s worth for everybody in the whole world to know how to cook this amazing dish don by a proficitional hands that cooks as for her beloved ones and it’s not a recepie , it’s a step by step in both pictures and in describing in the two languages . – it’s so useful for our children now adays sorry to say that but it’s the truth , they r more into English language in every thing ..